When I started MANFACE, I swore by gel creams. My skin was always oily, always breaking out. 5 years later, my skin has changed. It can still get oily, but using proper skincare and exfoliating well, my sebaceous glands are doing as they’re told and apart from a little shine – I’m relatively skin-normal. I still get blemishes, but these are increasingly infrequent and get them out quick and swear by Clinique Anti Blemish Clinical Clearing Gel. However, I still get pretty dehydrated which when you’re still very much oil-prone, is a total pain in the arse to control – am I right? So many ‘hydration’ products do bugger all and it’s like flicking water droplets into the desert. I don’t flake, but things can just look a bit dull. 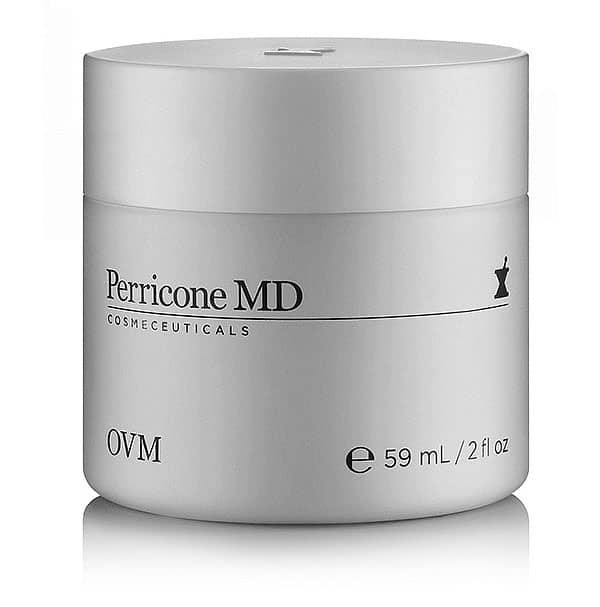 So Perricone MD OVM cream has been one of a series of products I’ve found really do the job well, delivering rich, balmy goodness whilst leaving skin soft, dewy and not the slightest bit greasy or congested. Opening the lid, *whoosh*, the smell is incredible. Like shea butter, despite not containing any. The power of this surprisingly water-based hydration cream comes from Vitamin C, Vitamin E and egg-shall membrane. Perricone MD has a history of using bizarre ingredients to create seriously impact clinical results. There’s also exfoliating retinol and Perricon’s own secret delivery system to ‘inject’ the ingredients deep into the skin. Perricone MD OVM feels very rich, balmy, heavy and even greasy to touch – if you’re oil prone you will have a shiver down your spine and think “oh god, I’ve wasted my money, I’m going to break the f*** out!”. But fear not, MANFACE has got you, it’s water based and once on the skin, feels incredible. Your skin will drink it in and you’re left feeling soft, smooth and your face looks lifted! You’ll seriously keep touching your face. Use only a small amount during the day, and feel free to use a little more at night. If, like me, you like to wear a little corrective makeup, bronzer or powder, Perricone MD OVM is the perfect base and sits akin to Bobbi Brown Mineral Enriched Face Base. This article first appeared on MANFACE written by Thom Watson. It was published on Monday 1st August 2016 and was last updated on Monday 3rd April 2017 at 12:47pm. It's categorised under Anti-Ageing, Combination Skin, Dry / Dehydrated Skin, Perricone MD where you'll find more related content. I’ve been sitting on a jar of this for the longest time and just started using – it’s phenomenal. I am so with you on the skin type evolution and have experienced the exact path – gel creams were my jam for years!